Ready for Your Close Up? Macro Photography Tips! April showers may bring May flowers, but if you're like us, you're noticing buds and shoots coming out all over the place already. If you've been thinking about getting into macro photography, there’s no better time than spring to do it. We hope these tips and gear suggestions get you out of the house and shooting all the buds and bugs! The obvious first step is the right lens. If you're on a budget, you can start out with a multi-purpose lens like this one from Sigma .The Sigma 18-250mm f/3.5-6.3 lets you get close, while still keeping some distance between you and your subject (helpful if you don’t want to anger bees or wasps or spiders!). With the flip of a switch you can change to macro, so without changing the distance between camera and subject, you can change the shooting magnification. Cool! We love this ring light from Sigma. The Modeling Flash function on this makes it possible to check for reflections and shadows before actually taking the flash picture. You can also use your usual off camera flash with a strobe to really freeze the little critters OR mount your Ice Light for additional natural light. When using a longer focal length to get back a bit from your subject, you'll need a tripod to keep it steady. If you're using a flash, you can get away with hand held but if you don't want to risk frightening an insect with a sudden flash then a tripod is for you. We'll have these models at a whopping 25% off with a coupon code in our newsletter. Sign up and don't miss the savings! Don't curse the April showers as right after a rain can be a great time to head out and shoot; flowers and leaves covered with delicate, magnifying and reflecting raindrops bring additional interest to your macro shot. Don't fret if you don't have a wildflower meadow in your backyard, your macro photography doesn't have to be exotic flowers or elusive insects, a simple blade of grass with a few drops of dew or rain is simply beautiful! Simple subject + April Shower = well executed macro! Do check your screen for a preview of what you're about to shoot (I call this “pre-chimping”); your eye might miss something that your camera is picking up, so make sure that there are no leaves or twigs or other distracting elements sticking into the corner of your frame. Check your angle! Could you move slightly below your subject and maybe change the background from something drab to something green or the blue sky? Will moving higher provide an even more interesting perspective? Don't get stuck just shooting straight on at the same distance all the time. 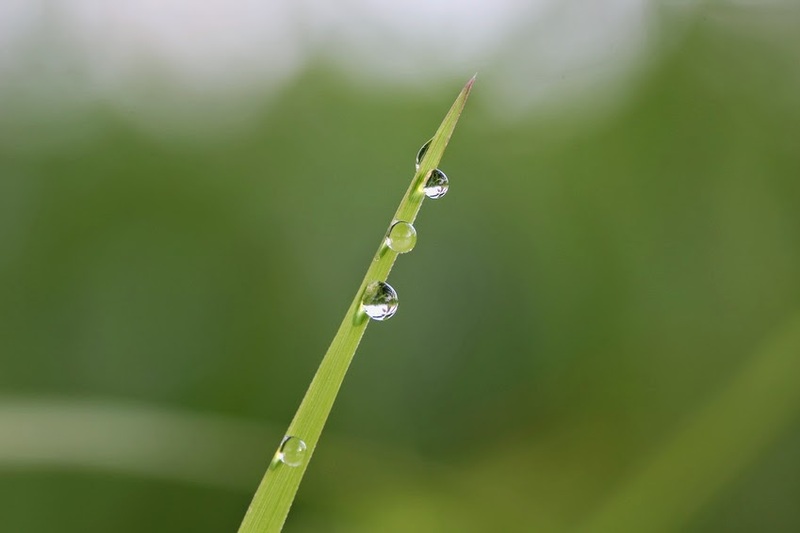 Finally, get some inspiration by checking out some online galleries of macro photography. This is what comes up when you do a search for “macro” on Flickr. Experiment and with these tips you’ll have BIG fun shooting tiny subjects!